There'll be tears through the land over this one: after a quarter-century in the commentator's booth, the Vatican's "Voice of Christmas" has announced that he's passed the mic. For the first time since 1984, the River City's own John Cardinal Foley won't be providing the English narration of the Pope's Midnight Mass, broadcast in the States through NBC, and traditionally the world's most-watched religious broadcast. The 74 year-old prelate -- who led the Pontifical Council for Social Communications from 1984 until his 2007 appointment as chief of the Knights of the Holy Sepulchre -- disclosed the news in a half-hour interview with Vatican Radio to commemorate his Silver Jubilee as a bishop. "I guess I'm truly the ghost of Christmas past now," Foley quipped to the broadcaster. 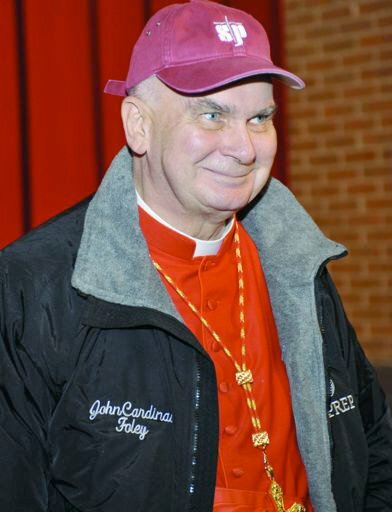 A product of Columbia's graduate school of journalism -- where he was sent on orders that he be "a priest who happens to be a journalist... not a journalist who happens to say Mass" -- the cardinal said last year that sought to be relieved of Christmas Eve duty on his transfer from the dicastery that handles the church's relations with mass media, but the Papal Apartment and NBC joined forces to keep Foley from going anywhere... at least, until now. "I thought twenty-five years was a good time to round it out," Foley told RV of the 24 December gig. "It's better to be able to walk away than be carried away from the job, and I thought it was important that a transition would be made." Keeping a less-known, but just as meaningful holiday tradition, the cardinal again offered Thanksgiving Mass last week at Santa Susanna, Rome's national parish for American expats and pilgrims. And on his last trip home in late October, a portrait of "His Foleyness" was unveiled at St Charles Borromeo Seminary, where the "patriarch" of Philadelphia Catholicism served as a professor of moral theology until his appointment to Rome, and still keeps his local residence. The painting will hang, however, in Rome, at the Holy Sepulchre headquarters just down the Via della Conciliazione from the Vatican.